Bill Lovelace in the Rebecca Fortney Inpatient Care Center’s sanctuary. Bill was so grateful for the care his brother and parents received from hospice providers, he told Rose he wanted to do something for a hospice organization. Fortunate for us, they live in Annapolis. Now there is a sanctuary, a learning laboratory, a scholarship fund and more that bear the Lovelace family name, all gifts to honor the memory of his brother and parents..
Bill’s generous philanthropic gifts are matched by his enormous gifts of time, including serving on the Foundation Board for Hospice of the Chesapeake. That is where he learned about the nascent We Honor Veterans initiative and what would become our signature element of the program – the Honor Salute. 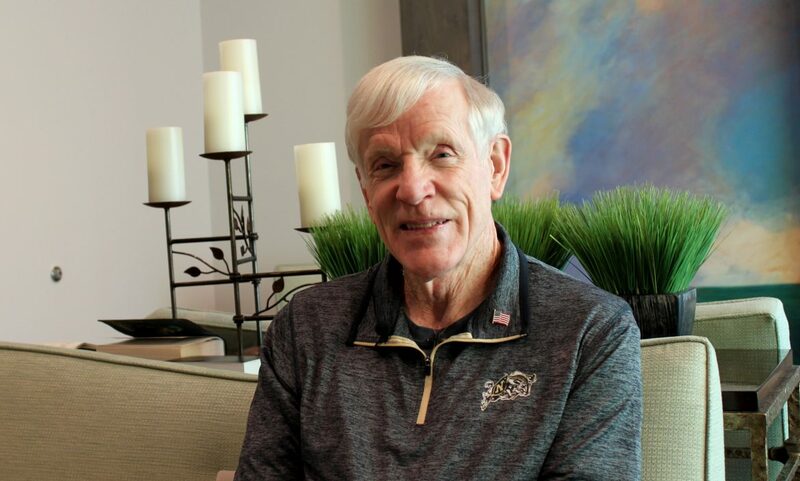 The former Army military policeman has an obvious love for the military and can be seen sporting Navy jackets and polos in support of his work with the Navy League. He got involved shortly after the Honor Salute program began in 2010 and has since facilitated well over 60. “I love doing it. Some of the experiences I have had are incredible and so rewarding to me to be able to honor these guys and ladies at the end of their lives,” Bill said. Bill has facilitated salutes in some pretty interesting places. Perhaps the most unusual was for a 69-year-old Veteran’s birthday party celebration. This man just loved Fuddruckers. So that’s where the party and salute took place. They found a little corner in the very noisy restaurant to honor the man with arcade games blinking and dinging as a backdrop to the ceremony. One particular salute that he says will always stay with him was for a 99-year-old Veteran who had served in the Navy in World War II and was a professor at the Naval Academy for 50 years. Joined by a contingency of Midshipmen, Bill asked one of them to see if they could find “Anchors Aweigh” on their smartphone. The man was completely unresponsive and stayed that way through ceremony. After the Mids had completed the formal salute, Bill asked the Mid who had found the Navy theme on his phone to play it. From the very first note, the honoree heard the music and started to lip synch to the music, singing to it from beginning to end without missing a beat. “By this time, I think everybody in the room was in tears,” Bill said. “The significant thing about this is — that man died that night.” It was the last form of communication he would share with his family. Anybody who shares Bill’s affinity for people could volunteer to serve at Honor Salutes, Bill said. It requires a minimal amount of training and time, with most salutes requiring about an hour of his time, though sometimes families turn it into a great gathering with food and storytelling of their loved one’s life. Perhaps his service in the Army is what fuels his understanding of how a uniform affects the Veteran patients.